Palonosetron is the most recent 5-hydroxytryptamine-3 receptor antagonist, and its fixed dose of 0.075 mg is indicated for the prevention of postoperative nausea and vomiting. This study aimed to examine whether fixed dosing is more appropriate than body size-based dosing through the development of a population pharmacokinetic model and model-based simulations. 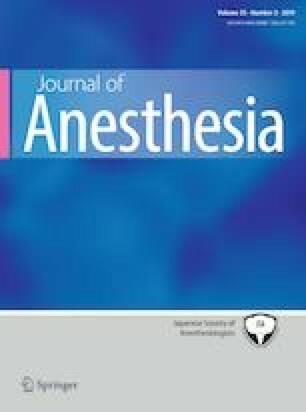 Fifty-one adult patients undergoing general anesthesia received single intravenous palonosetron administrations 30 min before the end of surgery. Palonosetron concentrations were measured in blood samples collected at various timepoints within 48 h. A population pharmacokinetic analysis was performed by non-linear mixed-effects modeling, and the area under the curves (AUCs) for fixed dosing and body size-based dosing were simulated. The pharmacokinetics of palonosetron were best described by the three-compartment model, and lean body weight (LBW) was the most significant covariate for all pharmacokinetic parameters. In a patient with LBW of 40 kg, typical clearance and central volume of distribution were 0.102 L/min and 6.98 L, respectively. In simulations, the overall interindividual variability in AUC (0, 48 h) of fixed dosing was not much higher than that of body size-based dosing. In subgroup analysis, the AUCs (0, 48 h) of fixed dosing were considerably lower in the high-weight subgroup and higher in the low-weight subgroup than the median-weight subgroup. In contrast, LBW-based dosing showed similar AUC distributions among the three subgroups. LBW-based dosing might be suitable for high-weight patients to avoid possible underdosing. Nevertheless, the current fixed dosing of palonosetron is acceptable for adult patients with normal weight. The study was registered with the Clinical Research Information Service, Republic of Korea (https://cris.nih.go.kr), prior to patient enrolment under registration number KCT0001254. No external funding and no competing interests declared. Guidance for Industry. Population pharmacokinetics: United States Food and Drug Administration; 1999. https://www.fda.gov/downloads/Guidance/UCM072137.pdf. Accessed 04/04/2018. Aloxi (palonosetron HCl) injection prescribing information: Helsinn Healthcare SA; 2015. https://www.aloxi.com/docs/pdf/pi.pdf. Accessed 04/10/2018.